Enjoy the sophisticated atmosphere of the Lake District. Relax in Bellagio - the wonderful city that shines at the centre of Lake Como, against the backdrop of the Alps - and in Stresa, the Pearl of the Lake Maggiore. 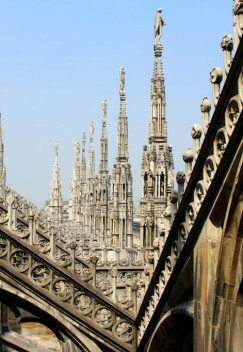 Last but not least Milan: the city of Expo 2015. 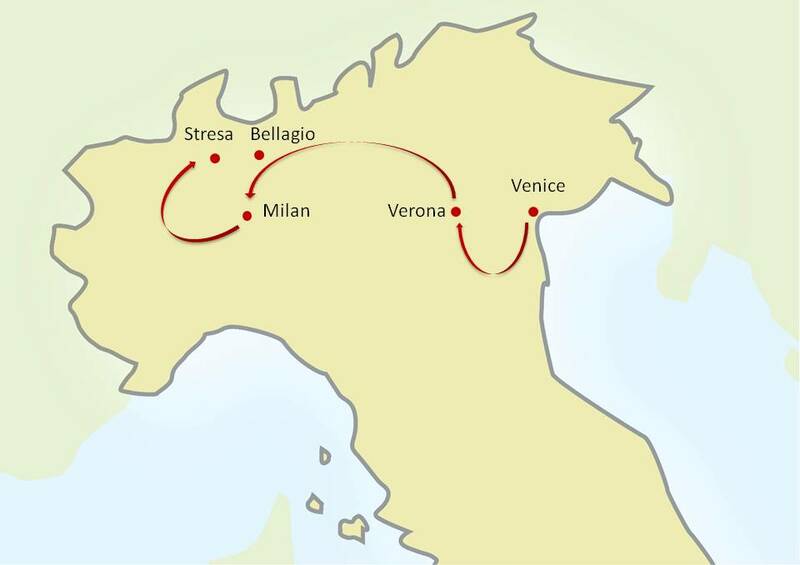 The Tour features Venice, Verona, Lake Maggiore, Lake Como and Milan. Discover the beauty of setting and the unique architecture of Venice: the entire city is listed as a World Heritage Site. Visit the famous Arena in Romeo & Juliet’s city: Verona. Promenade along the glittering waterfront, stone lanes and picturesque cobbled stairways of Bellagio. Sail and walk through the precious architecture of the Borromean Islands with their stunning palaces and gardens. Live the experience of the Lake Maggiore Express and Centovalli Train for one of Switzerland/Italy's most scenic journeys. Admire the Last Supper by Leonardo and go shopping in the famous Fashion District of Milan, the city of Expo 2015. 9 Nights accommodation in exclusive and fascinating 4 stars sup. Hotels or Historical mansions, with full buffet breakfasts: 3 Nights in Venice, 1 Night in Verona, 3 Nights in Milan, 2 in Stresa (Lake Maggiore). Private sightseeing Tours with expert local English speaking guides in Venice – Verona (Arena) – Milan (Last Supper); including all the entrance fees to the sites visited avoiding long waiting lines. Boat Tour of the central area of Lake Como. Private Boat Tour of the Lake Maggiore to visit the Borromean Islands with English Speaking Guide. Train Venice – Verona – Milan: 1st class tickets and seats reservation. Private transfer by deluxe van with English speaking driver from the airport. Private transfer from Milan to Stresa by van with English speaking driver. The Tour is available as self drive or with private deluxe van with English speaking driver available for transfers and excursions for the entire Tour. Tour begins in Venice and ends in Stresa. A private Guide will lead you to discover the highlights of Venice: visit St. Mark’s square, walk through the small “calle” (streets) and reach the “Rialto” bridge. After the walking Tour, a private Boat Tour on the Gran Canal will follow to explore the magic city built on the water. You can also visit the three main islands of the Venetian Lagoon Murano - worldwide famous for its glassware factories, Burano - famous not only for its hand lace-making, but also for its brightly-colored fishermen’s houses and Torcello, with its Cathedral decorated with magnificent mosaics or if you like you can also have a Bacari Tour: the Bacaro is a typical Venetian bar, offering delicious local snacks (called "Cicheti") and local wines (called "Ombre") at very reasonable prices. Verona is especially renowned for the legendary story of Romeo and Juliet, which inspired William Shakespeare to write one of his masterpieces. Most interesting is the well kept Roman amphitheatre, the Arena, in which monumental operas and music events take place during the yearly open air Festival. Thanks to its geographical position and to the fact that Italy’s second river, the Adige traverses the city, Verona’s eminent history began more than 2000 years ago. Important and amazingly well preserved remains of past times can be seen throughout the historical city center during your private guided Tour and you will also visit the Castle, lovely squares and landscapes. Your Guide in Milan will show you the city highlights: the Cathedral, the Galleria Vittorio Emanuele, Piazza della Scala, The Castello Sforzesco, including the Cenacolo where you will admire the “Last Supper” by Leonardo. Time free to enjoy Milan: shopping in the famous Fashion District (Via Montenapoleone, Via della Spiga, Via Manzoni e Corso Como), take a walk in the lively Navigli area. Full day excursion to the Lake Como and Boat Tour of the central Lake Maggiore area by a comfortable private water taxi to get a close view of all beautiful villas built along the banks of the lake. Full Day trip on board by narrow gauge train and ferry. With the Lake Maggiore Express ferry boat you will cruise up to Locarno, Switzerland, the northern tip of Lake Maggiore. Then you will bard the picturesque Centovalli train for one of Switzerland/Italy's most scenic journeys. The little train reaches many bridges and viaducts that span the valleys. Enjoy spectacular views and stop off in the rustic villages that the train passes through.